Well well, aren't we blessed with a winter wonderland this year! I feel so warm and tingly inside when it's chilly and snowy outside. I love getting layered up and going for a run in the fresh snow. Maybe even a late night moonlit run in the snow along the Arbutus corridor. It sure brings me closer to home during this time of the year. It's a nice change to have some dry precipitation. Even though it's colder we stay dry in the snow. The weather wasn't as mild as we were used to for this year's jokingly named "Winter Classic". It was a nippy minus 4 or 5 degrees Celsius the morning of the race and not expected to warm up at all by the early 8:30am start time. I was picked up by last year's race winner and fellow team mate Drew Nicholson at 7am. His father was along to support him as usual. Drew's family is very proud of him and come out to cheer him on whenever possible. He always likes to be nice and early and I don't mind either. I enjoy being there early because I don't have to deal with any crowds or line ups and the bathrooms are always in the best state at that time. Drew had already picked up our packages so we had nothing to worry about. It was time to relax and get ready for the warm up. I don't like to warm up too early on chilly days because I don't like too cool back down before the race starts. 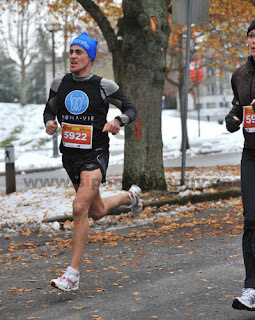 I was warming up in my track suit and had planned on wearing extra layers for this race. I remember last year was cold and rainy and I wore just a singlet and shorts with my Sigge's hat. This year was definitely too chilly for that so I opted for my Craft Pro Warm long sleeve mock neck compression shirt paired with my Sugoi running gloves and Sigge's hat by Louis Garneau. I put my MonaVie singlet over my long sleeve and just wore my shorts on the bottom half. Once again, my shoe selection was the Hyperspeed 4's from Asics and Forerunners. I can not say enough good things about this shoes racing ability. My feet know as soon as they get into them that it's go time!! Thank goodness for the most part, the course was fairly dry and clear of ice (almost). As runners filled the start line, I stripped down to my race gear and prepared for lift off. I felt calm and relaxed after the gun went off and led the pack out of the campus to Marine Drive. My Garmin was telling me I was quicker than I should be, but I didn't mind because I was running downhill and felt very relaxed. I was running a 3:12-15/km. As we flattened out I calmed my running and relaxed into a 3:20 pace per km. I checked over my shoulder wondering if Drew was going to push and stick on to my backside. He seemed to be a little ways back, but his string was still very much attached. I assumed I would be running a slightly quicker pace per km than him but he was going for it today. After all, he did have a reputation to fight for being that his sponsor put on this race and Drew won it last year. As he pulled harder on the string, he closed the gap between myself and him and by the time we were at the top of the hill before going past the lookout point he was right by my side. We entered the small dip and encountered icy road conditions. We fancy footed our way over the icy patches and found a clear line to run in. Drew has obviously been working on his downhill running lately and has done wonders on improving his form and technique. His long legs carried him swiftly as he pushed by me. My Garmin once again beeping at me to slow down as we cruised down the hill and I wondered if Drew would be able to maintain this gusto. I know where he has been training at and what pace he should be able to run and at this rate he would surely blow up. I chose not to surge any more, but to hang on and see what he decided to do. We levelled out and started to climb and I caught right back up to him. I relaxed on his tail for a bit and sped up my cadence to climb the rest of the hill. I like to push up the hills, it really helps to blast the competition and show what shape they are in and how they recover. Drew recovered instantly and passed me again atop the hill. I was feeling a little crummy at this point in the race so I decided that I would sit behind him and keep to his pace for a while instead of trying to run mine. Drew had a few more speed workouts under his belt since the marathon and was climbing quickly up to the level that Kevin and I were running. I was unable to keep the pace of 3:20 and we eventually fell below that to about 3:25-30/km on the false flat leading back towards the campus. I was grateful for the break and felt like hanging on was all I could do. I pretty much felt good the first third of the race and crappy the second and then had a strong last third. For the second third of the race I was mentally weak and had bad thoughts entering my head the whole way. I was thinking to myself "Maybe today is Drew's day," and "God I feel like crap!" or "Perhaps I'll pull out after the first lap." I accredit this to my lack of hot yoga lately. It's tough to motivate yourself when you are hurting or when these evil thoughts penetrate your mind state. I kept telling myself, "I feel great! ", and "You can do it, just hang in there." and was starting to feel a little better. We went through the half way point and Drew was pushing hard for the crowd. The cheering from friends raised my spirits and I mentally prepared and relaxed myself for the second lap. As well as the embarrassment I would have felt for pulling out, I knew that I could at least come in second if I kept going. I also told everyone at work that I wanted to win this race so I didn't want to let anyone else including myself down. We were side by side the whole way again and I had decided not to fight Drew but to let him dictate the pace. He seemed to be fading on the uphill again and I tried to test him but he was not about to give in. The Drew I had once known and raced against was back in full flight again. What a tough and gritty competitor. I did not expect such a battle when I entered into this race. As we got closer to the campus, I was trying to figure out when to make my move. I knew that I couldn't do it too soon because I hadn't felt that great up to this point. I accidentally kicked Drew's heels a couple of times as we were running so close and I could feel his pace waver. I was mentally sound again and really just waiting to pounce. By slowing my pace slightly, I was able to recharge some of my surge power. I figured I would wait until the last U-turn and the really lay it on. I passed by some of my fellow White Rock Peninsula Runners and they cheered for Drew and then they said "Pass him at the end Dave!!" to which I gave them a thumbs up. At this point, Drew pushed hard and we were back to 3:15/km I figured this was a little early and should stick to my plan so I hung on to keep the distance between us short. We climbed the last short hill and came to the very icy 30 meters of the course. There was no traction here and you pretty much just had to keep your momentum going across here and be very careful not to slip. I was able to lose Drew here the first lap and noticed I had dropped him again on the second. I knew that this was a good chance to start my push as there was a good straight away with very good grip before the last icy U-turn. I increased my effort to 95%, focused on my form and breathing and dug in. At the U-turn I concentrated on my footing as to not slip on the last treacherous corner. As I exited the corner I could see Drew entering and I knew then that the race was mine. I was very excited and could feel my Nitrous boosters ready to fire. There was 800 meters to go and I let the horses fly out of their cages. I sprinted hard and increased my effort to 100%. I hopped over some snow as I rounded the last corner and I could hear Steve King announcing me as the race winner I cranked the dial up to 110% for the final 20 meters and gave the crowd a speedy entrance. I was very happy to have won this race. It makes for a solid close to my 2010 running season. I can package it up neatly and do some cross training until the race scene opens up again in 2011. I was fortunate enough to set a new PB for the half marathon despite my crappy feeling during the run. 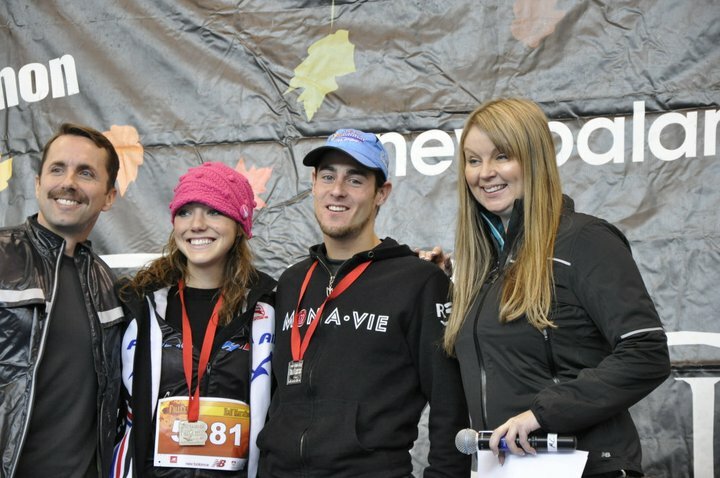 1:12:40 beating my Scotiabank Half Marathon time by 17 seconds. The post race food was great including Cliff Bars and home made chilly. I ended up winning a gift certificate for $130 for a pair of shoes for winning my age group and a $250 gift certificate to the New Balance Concept Store for winning the race. This is all fine and dandy, but for $70 per entry I would rather have had cash in hand. As a runner who trains year round I fully intend on making running work for me as I do it. Keep in mind they were kind enough to comp me my entry, however I do have a few bones to pick with the organisers. For an event with as much history and support that they have, they can do a few things better to accommodate the local running community. First off, They should be punctual and assertive in repairing mistakes and timing errors on the results before posting them. The event organizers must understand that people have been training for this event and have worked hard to battle for the seconds in which they earn during the race. Timing is of up most importance and should be monitored more accurately. This mistake was most prevalent in the 10k race. They do have the correct final times for the top 5 in all three races here. Another issue which I believe should be an easy fix; Please take the time to honour the age group winners from previous years with complimentary entries. Top three should be sufficient, or top one at the very least. This will ensure a high level of competition within each field and returning entrants. For the price that it costs to enter, and the high number of entrants, it would be nice if they could offer a cash prize to the top male and female overall finisher and top master male and female for the half marathon. The 10k race also had a large fee to enter and a high number of entrants. Some cash prizing could have been considered for this event as well. Most of the athletes who are winning races already have sponsors and probably own a lot of equipment for the sport, therefore deeming the product from one brand unusable for said athlete. I think that product makes great prizing for the age groupers, but races of this size need to help athletes. Heck if you want to impress me, throw me a few hundred dollars worth of grocery gift certificates or a flight voucher. That's what elite athlete really need!! How bout giving coach John Hill a bone for supplying this race with much of it's talent??? Am I ranting enough or just sounding selfish now?? I think I'll leave it at that and end this blog on one final note for race organisers. If you have the capability to cover your costs and get some great advertising and coverage in the process, why not help give back to the athletes who put in the cash and hard work? Take a tip from the good deeds done at this years Good Life Fitness Victoria Marathon and give back to your community, it will be worth more to you than the dollars you make off of the entry fees. If these few issues are addressed, I see no reason why this race won't remain as one of the last great runs of the year. I see that They have recognized the timing issue and claim it was a "Windows bug". They are taking time to correct the discrepancies. Great report, Dave. And congratulations again. Interesting to hear your beefs from the perspective of an elite racers. I had similar complaints as a mid-packer. The post-finish area was hugely crowded because they timed it such that the majority of racers from all distances would be finishing at the same time. I ended up leaving early because it was such a zoo. And the timing problems seemed a bit unusual. No results were posted even two hours after you guys finished, and even then they messed it up. The same thing happened when I did this race four years ago. Also, as a 1:50-ish half finisher, I found it strange to have the 10K runners on the same course as us an hour later. I would not have wanted to be an elite 10K runner passing through the masses of half-marathoners. As it was, anyone that finished the 10K in under 49 minutes passed me on the course-- it felt like I was being passed by everyone out there.